Several weeks ago I was contacted by Jennifer Osuch from the Survival Mom Radio to discuss the topic of Ham Radio. Yesterday, I received the list of questions/topics that she wanted to discuss. So I decided that I would post to my blog my research/answers to the topics that will be discussed during her pod cast. Once the pod cast is uploaded to the Survival Mom Radio website, I will post the link. Can you go over what HAM Radio is? Ham Radio, also known as Amateur Radio is many things, to many people and if you were to ask a dozen different Amateur Radio operators you would get at least a dozen different answers. Ham Radio is a very rewarding hobby that has many different appeals to different people. Weather it is the ability to talk to local friends using a local repeater and a handy-talkie or communicating digitally with packet radio to exchange a personal messages or vital information in an emergency. Others would say they enjoy talking to other Hams (rag chewing) all over the world or to engage in contesting with other Radio Amateurs. For me, I practice my Ham Radio skills so I can be familiar with the radios, rules and practices; so I would be able to communicate with other like-minded people in times of an emergency and you can find me on 80 meters (3.902) contesting, often. What is the difference between Ham Radio and regular Radio? By regular radio I am assuming Mrs. Osuch is talking about CB (Citizens Band) or FRS (Family Radio Service). CB Radio is commonly used by truckers as they go up and down our interstates. If they are used legally, not modified, they have a range of 10 to 20 miles and consist of 40 preset channels on the 11 meter band. FRS is an improved walkie talkie radio system that uses frequencies around 462 and 467 MHz in the ultra-high frequency (UHF) band and does not suffer the interference effects found on the Citizens’ Band. The FRS radios are also known as line of sight communications and have an effective range of around a mile or less depending on the quality of radio used. The major difference in the Ham Radio Bands and the other two is that you have to be licensed by the Federal Communication Commission (FCC) to use the Amateur Bands; meaning there is a high standard of operation on the Amateur Bands that is not usually found on other types of radio communication. Why would Ham Radio be so important in a collapse? There is an old saying, “When all else fails, Ham Radio gets through.” What makes Ham Radio work is that is it has flexibility. It is not tied to channels (except one band) but is made up of blocks of frequencies and in those frequencies there are multiple modes that can be run. 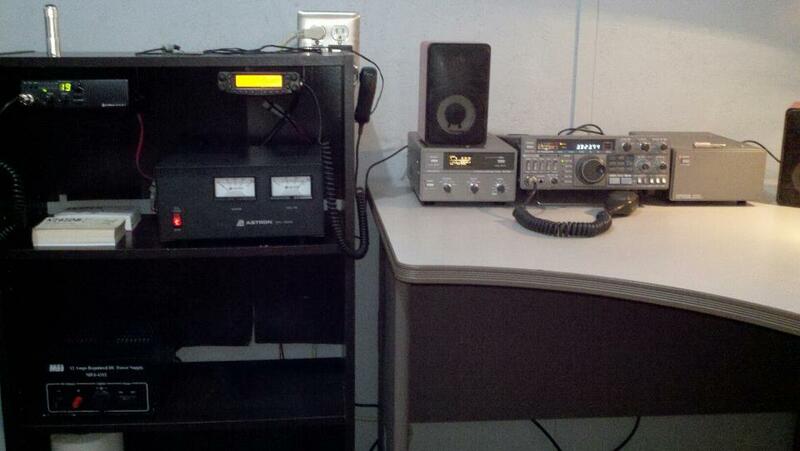 But more importantly, Ham Radio operators are trained and very knowledgeable. I know in my “SHACK”, what Ham Radio Operators call there radio room, I have 6 different radios, several power supplies and outside I have an even larger number of antennas. These multiple radios, power supplies and antennas gives me the versatility to make communications with other Amateur Radio Operators all over the world. Other types of radio communication just can’t compete when there is a collapse and our trusty cell phones want work. Why do you have to have a license to operate a Ham radio? What are the different levels of licensing? First of all, why would you not need a license to talk on a CB radio or the FRS. In order for these services to be available to the general public, the FCC requires manufactures of such radios to follow very specific rules on design, restrictions on power, and the pre-approved frequencies they can operate on. With the FRS you are limited to half a watt of power on 14 channels and the CB is limited to 12 watts on 40 channels. If you amplify the signal you might find yourself having a very unpleasant conversation with the FCC. In contrast Amateur radio opens up these boundaries. There are no channels in Amateur radio and the power is turned way up. My first 2 meter radio I purchase (used for $25) had 50 watts of power and hams can operate with 1000 watts of power or more depending on the frequency and mode you are operating on. When you first become a Ham, by passing the Technician class exam, you are given access to 17 bands of frequencies. With the proper equipment you can receive and transmit in your licensed area on any of these bands using many different modes (CW, phone, digital etc.). Pass the General class exam and you receive a larger portion of the ten high-frequency bands in which you can talk the around the world on; some part of every amateur band is represented in the General Class privileges. Study a little more and you can pass the Amateur Extra exam and have full access to the entire amateur radio spectrum. Can you describe a Ham Radio Set Up? What does it look like? Do you have to have special Equipment/Antenna? There is a tremendous variety in what different people may require for their ham radio shack/amateur radio station. When I first got licensed as a Technician class operator I had two radios. I had a used mobile 2 meter radio mounted in my truck and a very old Kenwood Handy Talkie (walkie talkie) that I carried everywhere with me. Later on, I set up a power supply in the living room with a dual band (2 meter/70 Centimeter) mobile radio connected to a vertical dual band antenna on a 20 foot push-pole attached to the back deck. With that simple rig I talked all over the state using a linked repeater system and was even able to connect to the world using the IRLP (Internet Radio Linking Project). As I progressed with the hobby I obtained my General Class license which opened up the world to me. A fellow Ham donated a 30 year old Kenwood TS-430S, power supply and tuner. I built an 80 meter dipole antenna (Long wire stretched between two trees in the back yard). The dipole is connected to the tuner, so I can use it not only on the 80 meter band but also the 40 meter, 20 meter and 10 meter bands. My wife finally kicked the radios out of the house so my 16 year old son, also a Ham, and I converted a 10 X 10 storage shed into a Ham Shack. In the last two years we have added another HF radio, an 11 meter radio and placed a 40 foot tower in yard. The tower is used to hold/support our growing antenna farm. So far we have the 80 meter dipole, a 10 meter dipole, an 11 meter vertical, a 2 meter vertical and a 70 centimeter vertical. I have only purchased one radio new. All the other equipment has been purchased used or donated by older hams. The 40 tower we put up in the yard was purchased very used for $200. All we had to do is disassemble it, move it and set it up. Hams are some of the most generous people you will ever meet. What is the purpose of a call sign? A Ham radio call sign is a designation given to an amateur operator by a licensing board which here in the United States is the FCC. The call sign identifies the operator to anyone who might hear his or her transmission and must be announced at the end of each transmission and at least once every ten minutes during a transmission. How do you talk to people overseas and how do you join a conversation? First of all you must have an understanding of the bands and what they do. If I am talking on the 2 meter band I would know that band properties, under normal conditions, only allow short distance communication and should be used mostly for local contacts. So I would pick a band, like the 10 meter band, that I know if it is propagating I would have a good chance of chatting with a foreign station. When chatting with a foreign station you must identify yourself in English, if you are a US station, no matter what language you are using for your foreign contact. I mostly communicate in voice mode so I will explain that type of operation. To call, say “CQ” (calling all) three times, then state your call sign. When answering another stations “CQ” call, say that stations call sign then “this is, then your call sign. If you are listening to an ongoing conversation you need to wait for a break in the conversation, then say your call sign. You need to wait for one of those stations to identify you and then you can join in on the conversation. For some reason the Technicians test was very hard for me. I did not have any understanding of radio or electronics and I was very nervous when I took the test. I failed it the first time out. But I went home and studied more, the next month I passed it. I then spent six years playing with the radio, learning how to use it and how radio propagation works. When I went back to take my General Class test I passed it the first time. Are there any precautions you need to take when you’re on the radio? There are no real general on the air precaution I would share with anyone but I would remind everyone that Ham radios are very powerful and some of them push lots of watts. You need to be careful and follow all safety measures to make sure you do not get electrocuted. The other precaution I would stress is, that unlike CB radio, courtesy and staying in your licensed area is a must on the Ham radio. You would hate to work so hard to get licensed only to have the FCC take if from you. What would you recommend someone to do today if they are inspired to get started in Ham radio? I would start by searching out a Ham Radio Club in your area. I am a member of my local club and the members have helped me in all aspects of Ham radio. Most clubs have people that volunteer as Elmer’s (Ham radio mentors). Your Elmer will help you find all the study material needed to pass your test, help you find equipment and get you comfortable on the air. If there is no club in your area I would get on the http://www.arrl.org web site. The ARRL is the American Radio Relay League and it is the National Association of Amateur Radio. It helps connect Hams from around the U.S. with news, information and resources. You can also find me on my Palmetto Prepper Facebook page, http://www.facebook.com/PalmettoPrepper/posts/246268702182109#!/PalmettoPrepper , or on my blog at https://ki4idb.wordpress.com/ . I hope to hear you on the radio soon!